I LOVE Red Lobster, but alas.....our love can never be! The amount of salt in their meals makes me swell and gives me massive headaches! Who's gonna go through all that for some damn Admiral's Feast?!? Not me......that's who!! I decided to try my hand at combining my two favorite flavors......crab legs and scampi......to recreate my favorite meal.....without adding salt! 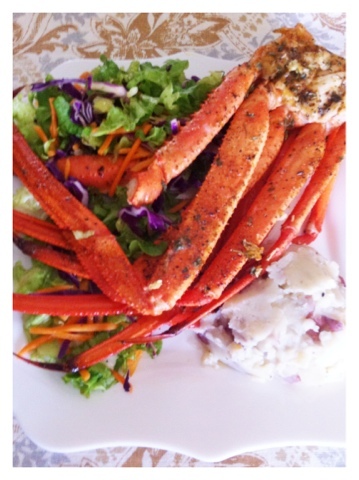 I even added Parmesan & Garlic Red Mashed Potatoes and plates the crab over my salad so when I drizzled them with pan drippings, I wouldn't need salad dressing! 1. Preheat oven to 400 degrees. Prepare crab legs by slightly cracking shells and claw. 2. Drizzle crab lightly with Olive oil. 3. Sprinkle with seasoning & garlic to your preference. 4. Roast 15-20 minutes or until shells start to blister. 5. Baste halfway through with pan drippings. Do not let garlic burn! 6. Remove from oven. Drizzle with pan drippings, lemon juice, or both!